Hi, Those Jews Are Spreading Homosexuality Dust around us! It seems that the Iranians never stop producing all type of statements that reveal the inner working of a fanatical religious regime that is obsessed with branding good and wrong, god approved and satan’s work. 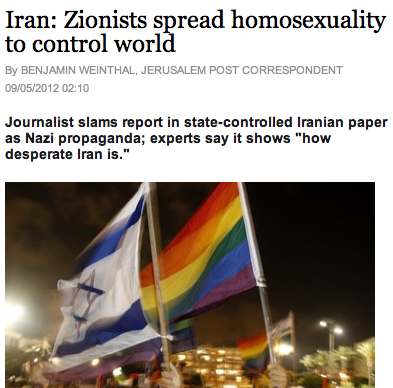 This time Iran accuses Israeli “zionists” of “spreading” homosexuality around the world. How wrong can anyone thinking that a sexual orientation can be “spread” and moved from one person to the next can be?, how could you even start to explain the basics of human sexuality to these kind of people. The tendency to label homosexuality as something that is invented, or a disease of some sort that can be cured and passed is not new to the Iranians, they have been busy hanging their own gays for many years now, and always finding the proper reasons for it, for example one will be hard pressed to find that someone was hanged because he was gay, but because he did terrible sexual things (sometimes, they go as far as to say it was done to children), the same tactic is used by the regime on Jews, they are not arrested for being Jewish but for being spies for Israel. The religious persecution is in this case mixed with the religious ordered hatred of Jews, attached to a non traditional sexual orientation the Iranians condition their supporters to see anyone who is not them as one big bad block of humanity. It is sad and appalling that in this time and age wild fantasy like this could be harbored by people how are simultaneously developing atomic weapons.